As this week approaches us, we encourage each and every one to remain vigilant and monitor these two weather systems. In collaboration with the NWS service, GOHSEP continues to maintain contact in order to provide the most up to date forecast. We expect to have a much better understanding and forecast on these systems in the next couple of days. Tropical Weather Outlook: The National Hurricane Center is currently monitoring two (2) areas of low pressure in the Gulf of Mexico and Atlantic Ocean regions. Please stay tuned to the National Hurricane Center and your Local National Weather Service Office for the latest updates. Disturbance #1 (Orange): Showers and thunderstorms associated with a tropical wave about 800 miles east-southeast of the southern Windward Islands have become a little better organized since yesterday. Some additional development of this system is possible during the next couple of days before environmental conditions become less favorable for tropical cyclone formation. This system is forecast to move to the west-northwest at near 20 mph toward the Windward Islands and northeastern South America during the next two days, and interests in these areas should monitor its progress. Regardless of development, locally heavy rains and gusty winds are likely to spread over portions of the Windward Islands Monday night and Tuesday. An Air Force Reserve Hurricane Hunter aircraft is scheduled to investigate this system on Monday, if necessary. Formation chance through 48 hours..medium...60 percent. Formation chance through 5 days..medium..60 percent. Disturbance #2 (Red): Surface observations and satellite data indicate that a broad low pressure area is centered near the east coast of the Yucatan Peninsula. This system is producing a large area of showers and thunderstorms along with winds to gale force several hundred miles to the east and northeast of the center. However, the low lacks a well-defined center of circulation, and the Hurricane Hunter mission scheduled for this afternoon has been canceled. 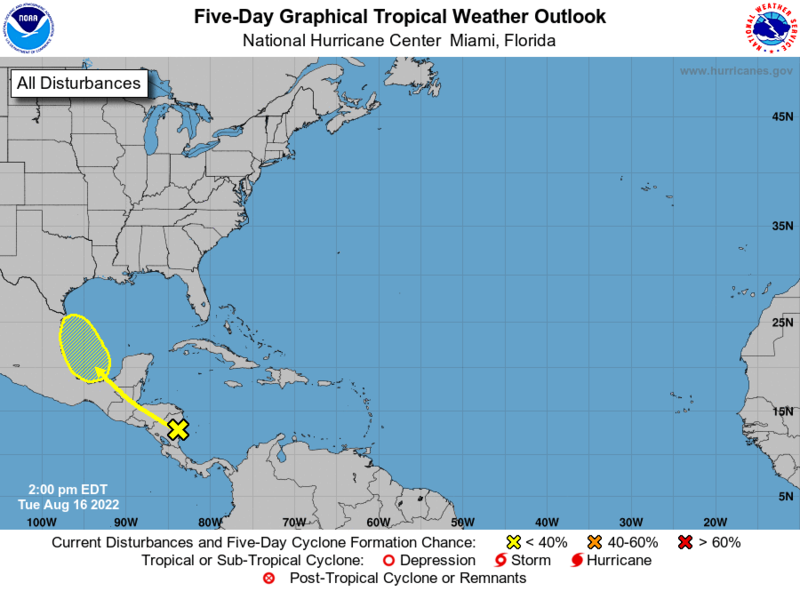 Gradual development is expected while the low moves slowly north-northwestward across the Yucatan Peninsula through tonight, and then over the southern or central Gulf of Mexico on Monday and Tuesday, where a tropical or subtropical cyclone is likely to form. Regardless of development, heavy rains are expected over portions of Central America, the Yucatan Peninsula, Jamaica, the Cayman Islands, and western Cuba during the next several days. An Air Force Reserve Hurricane Hunter aircraft is scheduled to investigate this system on Monday, if necessary. Formation chance through 48 hours...high...70 percent. Formation chance through 5 days...high...90 percent.